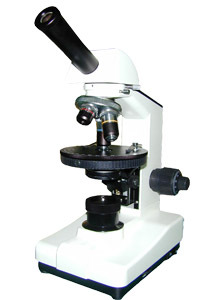 JPL135 series polarization microscopes are utilized polarize light to observe and research the polarize characteristic of the matter which have the double refraction. They can be used to medical inspection, such as the frame detail of the nerve fiber, the animal muscle, the plant fiber and the crystal of the tooth, bone, hair and alive cell etc. It can be observe the fine frame of the biochemistry salt crystal that the fine frame can’t be observe for nature light. Equipped with wide field eyepieces and achromatic objectives, the field of view is widely and clear. 6V 20W halogen lamp transmission illumination, adjustable brightness. Monocular , 360?rotatable, inclination of 30?